Fly a private jet charter to or from the San Francisco Bay area with JetOptions. Enjoy San Francisco and all the surrounding regions when you travel by private jet. Whether you’re flying directly into San Francisco, visiting nearby Silicon Valley, going on to Wine Country, or any of the beautiful cities surrounding the bay you have your choice of many airports when you travel by private jet. For executive jet charter and leisure travelers, here are a few of the many airports to transfer in and out of with your private jet. Choose from the San Francisco International Airport, Half Moon Bay Airport, Metropolitan Oakland International Airport, Hayward Executive Airport, Norman Y. Mineta San Jose International Airport, Livermore Municipal Airport or any preferred airport for your arrivals and departures. Take a helicopter and land at the heliport in the San Francisco Bay area to visit Alcatraz. The nation’s first military prison, this maximum security prison was originally used for Civil War deserters, insubordinates and those who had been court-martialed. Take an Alcatraz Cruise and hear the fascinating history of the grounds, including stories about former inhabitants such as Al ‘Scarface’ Capone and George ‘Machine Gun’ Kelly. Today, the area is a national park, providing an informative and spooky visit. A private jet charter to San Francisco Bay area can take you to the famous Ferry Building. Formerly a transit hub, this center of food and fun has everything from restaurants, to food stalls to a farmer’s market and craft goods. You can hold an event in the space, such as a corporate event, wedding or gala. The Ferry Plaza’s Farmer’s Market is a California certified farmer’s market operated by the nonprofit Center for Urban Education about Sustainable Agriculture (CUESA), featuring quality and diverse products. An attraction not to be missed with your private jet charter to San Francisco Bay area is Golden Gate Park where you’ll find the de Young Museum, California Academy of Sciences, San Francisco Botanical Garden, Japanese Tea Garden and Conservatory of Flowers and Stow Lake. At the California Academy of Sciences, you’ll find everything at one of the largest, innovative and eco-friendly natural history museums in the world. This museum has an aquarium planetarium, natural history museum, 3D theater, lecture hall, two restaurants a gift shop, garden, and aviary. You can tour the “rainforests of the world” enclosed in a 90-foot diameter dome with the rainforest habitats of Costa Rica, Borneo, and Madagascar. Go on a hands-on exploration at the Discovery Tidepool with hermit crabs, sea stars, and other creatures. See the stars at the Planetarium with real-time data provided by NASA. The Naturalistic Center includes research exhibits, specimens, lectures, and small public programs. Attend a talk at the museum that has hosted the likes of many luminaries, including former vice president Al Gore. See more creatures at the swamp that has turtles, subtropical fish, and a rare white alligator. Explore more private jet destinations in our series. Explore Los Angeles, San Diego, and Southern California or nearby Napa by private plane. Las Vegas is just over an hour from San Francisco, and Hawaii is only about 6 1/2 hours away. 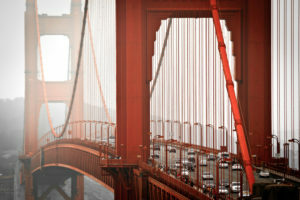 Visit the city by the bay with a JetOptions private jet charter to San Francisco and the Bay Area. Call or email us today for your next private jets charter booking today.